I Love My Amazing Animals: A visit from a lizard and Follow Friday Four Fill-In fun! A visit from a lizard and Follow Friday Four Fill-In fun! How would you like to see this little cute creature crawling out of the bathroom sink. That is what my daughter found while we were on vacation. I don't think I would find a lizard where we live! Our climate is just too cold. This little critter was so cute and small. I'm not sure how it lived in the pipes. So, she took it outside and set it free! Hopefully I won't find any snakes crawling out of our sink in the bathroom! 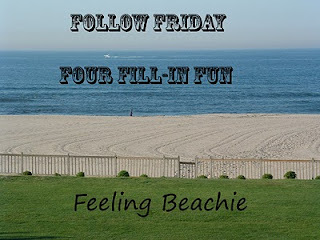 Like last Friday, my friend, Hilary, at Feeling Beachie, is having the weekly Follow Friday Four Fill-in Fun blog hop and I am the co-host to the hop! Yup, you read that right, I am the co-host!! Just like last Friday, here are the four statements that I will fill in. 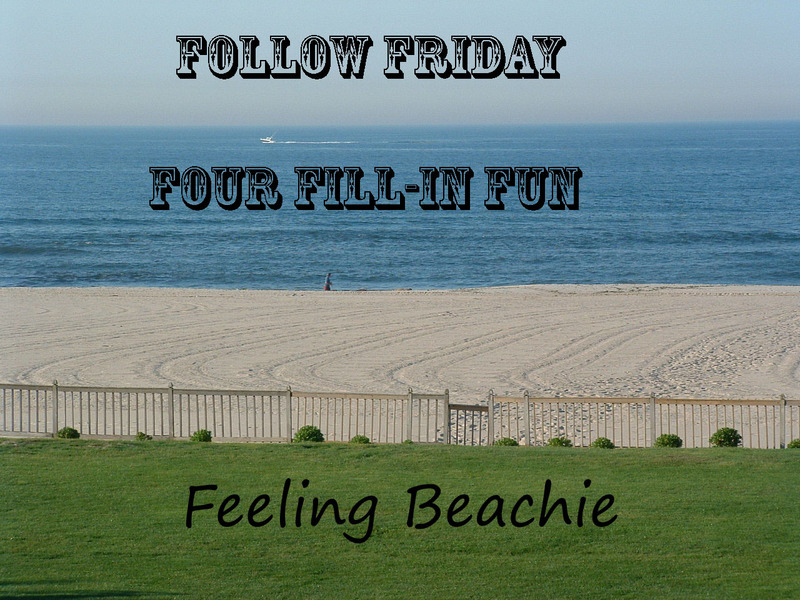 If you want to join the fun and come up with four fill in’s of your own, please email them to Hilary at feelingbeachie@gmail.com If she uses them, Hilary will add you as co-host to the hop! 1. Over the years I have had so many different hair colors and styles! 2. It drives me crazy to come home after working all day to find out that the kids didn't do the kitchen but they sat on the couch all day long and played video games! Now that drives me crazy! 3. Every time I walk in the house I wash my hands. 4. Right before I jump in bed, I make sure all the animals are accounted for! I make sure no one was left outside by mistake. Could you imagine..I would freak out if I ever did that! So if you want to visit Hilary...just press GO HAVE SOME FUN! You can also follow along below! Have fun! OMG! I love that we have the exact fill in for #1, and almost the same for #2! I guess that saying, great minds think alike rings true! Have a great day! Mayyyyyybe the Lizard didn't come from the pipes. See how it's the exact same color as the granite counter top? Could it have been living on the counter for awhile and nobody knew it, it being totally camouflaged? You are right you did make your blog easier for me to come to. It took me 25 minutes to load today only. It use to take 2 hours. Thank you Sweetie. Wow, a lizard? Cool! We've never seen one... but we do see toads in our yard in the summer! This would not surprize me where I live! Unfortunately, we did get a snake in the house! Came up where a cable wire use to be. I won't share what it did, but we sure wondered what Billy was thinking all the time the incident was going on! Great fill-ins - #4 made Mom think about what happened here yesterday. When Dad left for work, he hadn't shut the back door to the garage tightly enough for it to latch. Mom was upstairs at the time. He left and closed the garage door which made the back door open wide. Mom came down to the kitchen and saw the door open and immediately panicked. She did a furball headcount and found Phantom and Thunder quickly. She could not find Ciara anywhere and was so worried she had run out the garage door when it was closing. She was pretty worried and was going to find her coat and a leash when the Pest came walking out of the laundry room. Whew - what a relief! That little lizard is so darn cute! Awwwww what a cute lil lizard!! Glad your daughter rescued it! Yay!!!!! That little lizard is pawesome! Once we saw one and my mom screamed like crazy! Those are very interesting things about you! # 1 and # 3.... same as my mom! That little lizard needs a thwock!! Actually, I wouldn't mind finding a lizard in my sink! Dad left moms last dog outside all night he thought mom had put Jack in the kitchen! She was so upset when she found him in the morning. Its OK dad double checks I'm in my bedroom! Creepy! I don't think I would like to find one of those.... As far as checking -- nothing wrong with that! Better to be sure!